I kid you not, these muffins are scrumptious. They are not one iota dry or tough and they have oodles of bran and ground flax seed so you truly can’t go wrong here. 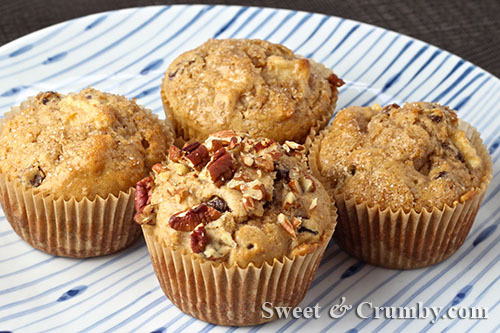 If you were ever going to give a healthy type berry muffin with oat bran and ground flax seeds a go, wouldn’t you want to try one that has been given the Sweet and Crumby (S&C) stamp of approval? Wouldn’t you want it to taste bad to the bone but be oh so angelic? Categories: Bread | Tags: blueberry muffins, bran muffins, flax seed muffins, healthy muffins | Permalink. 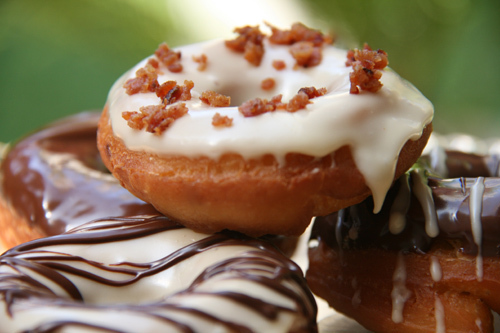 Over the weekend, I woke up with one clear thought, “I MUST make doughnuts.” And if you are going to bother with the the huge vat of oil, wait for the dough to rise and eat a ginormous amount of calories, then you may as well jump in with both feet and make Maple Glazed Doughnuts topped with Applewood Smoked Bacon crumbles. Don’t you agree?